Malaysia!!! are you ready for Bieber Fever! OMG!!! I can feel the heat right now, right here... can you feel it??? Belieber or not, I have ot good news for you! 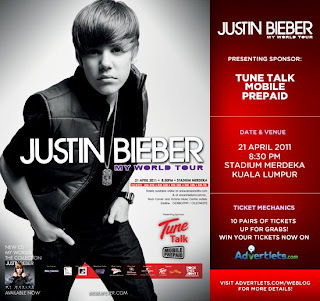 Justin Bieber (My World Tour) Concert Live in Kuala Lumpur 2011 is confirmed on the 21st April 2011 (Thurs). The superstar is scheduled to perform at Stadium Merdeka, KL at 8.30pm. This is the much awaited concert Malaysians have been looking forward to for a very long time, all Bieber fans should be all psyched up for this mega event so prepare for the concert of the year. The best thing is that this contest is open for everyone. It doesn't matter whether you are a blogger or not. You can get your hands on the tickets for both. Sound great right! I also want it! I wanna go for Justin Bieber Never Say Never Movie Premier!!!! Tune Talk is the proud sponsor of the upcoming Justin Bieber concert and his movie “Never Say Never” in Malaysia. Login to Tune Talk prepaid now! you will Never Say Never. Awesome!!!! That’s it! 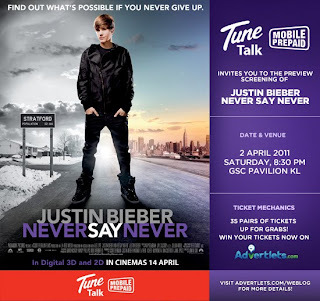 3 ways to Win Justin Bieber concert tickets & movie premiere! So start changing your display picture, get as many LIKES or blog your way to the movie premiere. Damansara, on 16th April, 2011 (Saturday) from 2pm onwards.